It's a dark and stormy night. As a young couple cuddle in bed the mud of the garden is stirring. Slowly the earth tears itself asunder and someone - someTHING claws its way out of the dirt. The man gets up for a drink of milk. As he goes to the fridge he notices the back door's open. He takes a drink of milk, pausing for a moment, some deep animal instinct telling him that not all is not well. Quick as a flash a small black flash skitters past the camera. He shrugs, figuring it must be the wind. Climbing back into bed with his wife he cuddles her as she curls up under the blanket. Then his wife walks in from the bathroom. Who... WHAT is in bed with him? A shiver runs down your spine. It's a classically constructed horror set up. 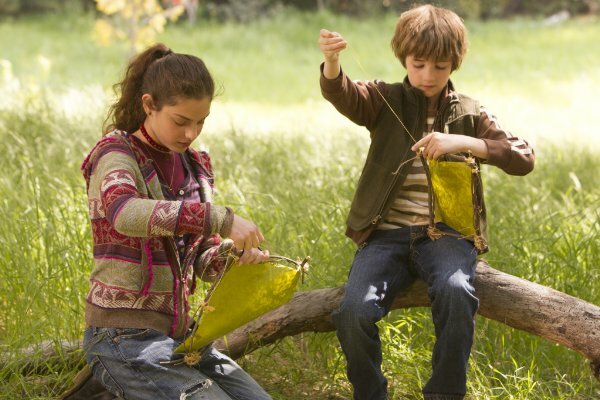 But this isn't a horror film; The Odd Life of Timothy Green is a (slightly confused) small town Disney fairy tale. The story, told through the framing device of an adoption agency interview, concerns the lives of Cindy and Jim Green (Jennifer Garner and Joel Edgerton), a young couple unable to conceive. After their hopes are crushed for he final time they get hammered on red wine and play a slightly depressing game where they write down what their perfect son would be like. They must be pretty out of it by the time they finish, because for some reason they decide to bury the box in the back garden. 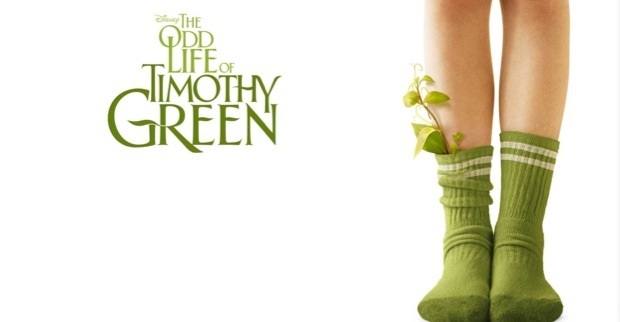 Anyway, out of the dirt comes the summation of their desires; Timothy Green (CJ Adams), a boy with leaves growing out of his ankles. It's kind of an inverse Pet Sematary. Joel Edgerton and Jennifer Garner as Jim and Cindy having a heavy night on the wine. Leaves aside, Timothy is an idealised ultra-child, practically perfect in every way. He acts like the product of intense focus-grouping by doting grandmothers with the aim of creating a grandson so utterly wholesome and sweet that sunlight itself dims in his presence. This kid Messiah then takes it upon himself to sort out the problems of everyone around him, ranging from encouraging a girl to show off her birth mark to saving the local pencil factory. On paper he sounds unbearably obnoxious, but to be fair, CJ Adams makes him bearable. The problem is, despite being the subject of the film, Timothy isn't so much a character as a dramatic device. The real drama here comes in the form of Cindy and Jim's desire to be the best possible parents they can be. We watch them trying to balance work with family, standing up for Timothy against bullies and supporting him as best they can in anything he turns his hands to. Both Garner and Edgerton are believable enough as people thrown into being parents overnight. Their pride in Timothy and their shame when they feel they've let him down is obvious. But this focus leads me to wonder something - who is this film aimed at? The central story here is whether Cindy and Jim can prove to be successful parent. Cindy is apparently an orphan, and we're repeatedly told that Jim's father is distant and emotionally unsupportive (although for someone so distant he sure does turn up at a lot of events). Is a couple struggling with infertility and parenting expectations really what children want to watch? It's not that I don't think young children aren't able to relate to the emotional needs of their parents, but I wonder just how interesting they'll find this. The most obvious identification point to young audiences, Timothy, is little more than a boy-shaped cypher. His relationships are seen primarily from an outside, adult perspective and we never get a handle on what he might want out of life. The mysterious fog around Timothy never dissipates, meaning there's a constant sense of a more interesting story going untold in the background. 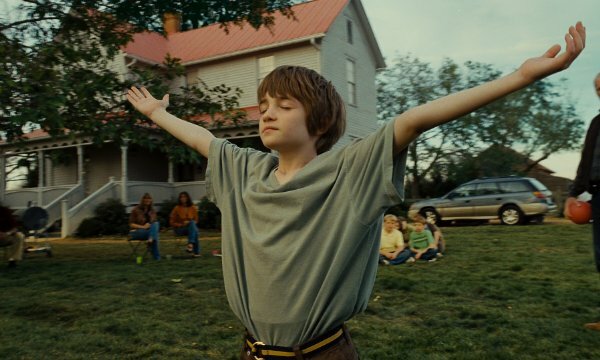 The question that was on my, and I suspect many people's minds, throughout the film is just what the hell is Timothy? Leaves grow from his legs, he seems to photosynthesise and can apparently breathe underwater. Essentially he's a green man: a character from ancient British pagan mythology often representing fertility, so it's quite appropriate he should appear to a couple unable to conceive. In addition his creation from a box of wishes buried in the back garden echoes the hoodoo religions of transported African slaves. Considering these events take place in a small, sleepy US town the church is notable by its absence, aside from one microsecond in the finale Christianity may as well have passed this town by. He's not the Messiah, he's ̶a̶ ̶v̶e̶r̶y̶ ̶n̶a̶u̶g̶h̶t̶y̶ an actually quite well behaved boy! This is frustratingly ripe thematic ground: I want to see what happens when pre-Christian mythology collides with white bread American life! But, sadly this isn't that film. As far as interesting themes go, the best you're going to do here is that you should support your kids without smothering them and that it's alright to be different. It's a film of sadly limited ambition, and worse, it doesn't even fulfil these. I guess teaching children that it's alright to be different is a useful warning of the dangers of conformity, but they pick two pretty damn easy examples to prove this. Timothy is every inch a child star and the girl he inspires to show off her birth-mark is similarly movie-glossy Disney child perfect. If you want to make your point a bit more powerfully, why not pick some more serious and troubling examples? Yes it's fine to be different, but these characters aren't really different - and one of them is some kind of plant creature! By the time the ending rolled around I was near to retching from the heaping ladles of syrup the film was doling out. It gets exponentially preachier and more manipulative as it goes on, until the Disney ending you see coming from the first frames. At the core of this story is something tantalisingly interesting, but by the time it's made it's way to cinema screens almost everything of interest has been surgically removed leaving a bland, flavourless and ultimately pretty damn forgettable experience.